I know we featured quite a few shots of Frama’s Salon exhibition during my 3 Days of Design wrap-up, but when I suggested we dig a little deeper into what this new-kid-on-the-block of Danish design was all about, Dana was a go-go. I think her exact email words were “…love, love, love those guys!” So here we are. became apparent to me almost immediately after I moved to Copenhagen a couple of years ago. I heard on more than a few occasions that this group of young guys are doing some very cool things. I then started noticing their retail line all over town. I mean – ALL OVER TOWN. Their Adam stools have become a Copenhagen hospitality mainstay. What was not so obvious at a first glance, but is glaring now I know a little more about the Frama universe, is how much time, energy and love they put into their collaborations, experiments and case studies. 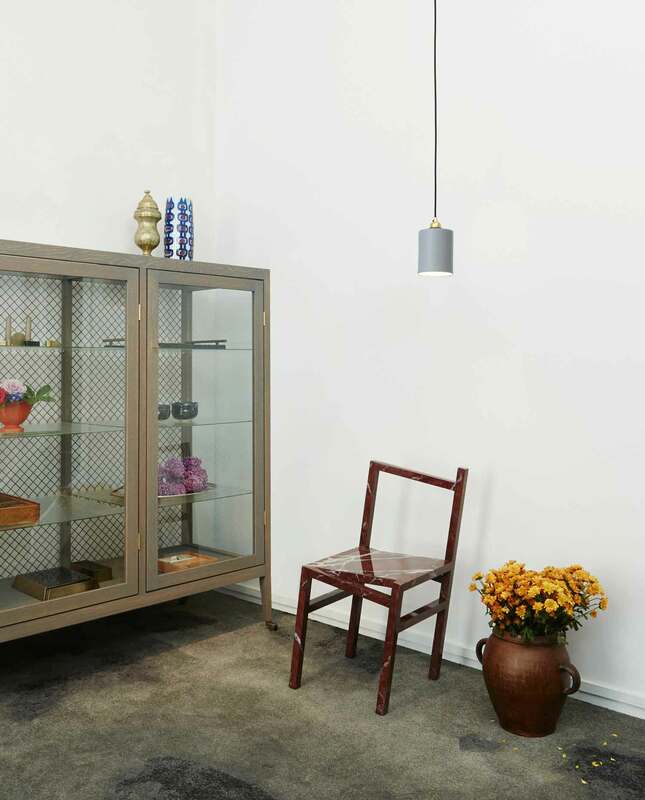 It almost feels to me as if their retail range is more the launching pad to the true passion that makes up Frama – working with gifted artists and crafts people, and making design an obsession. Event Report: 3 Days of Design, Copenhagen. 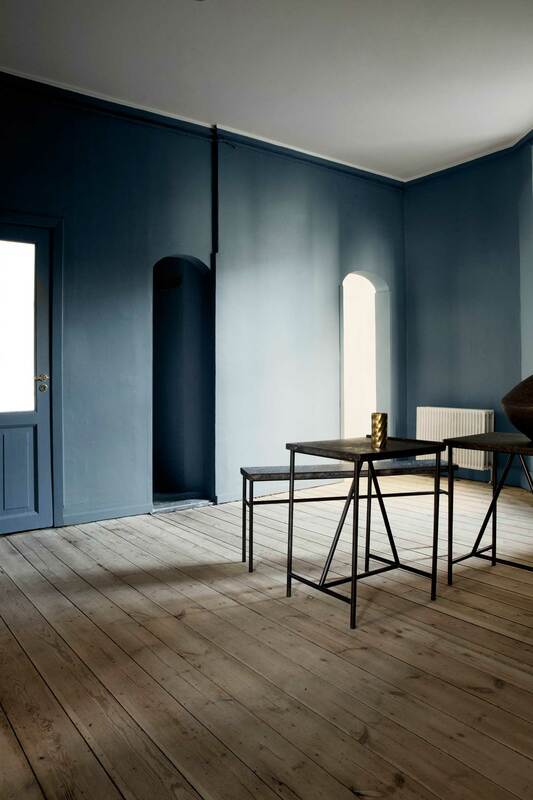 Salon featured the “Blue Room”, a space allowing Frama to present their custom St. Pauls Blue with both Jotun and Linolie.dk. The Adam stool in a muted orange sits perfectly within this sea of blue. 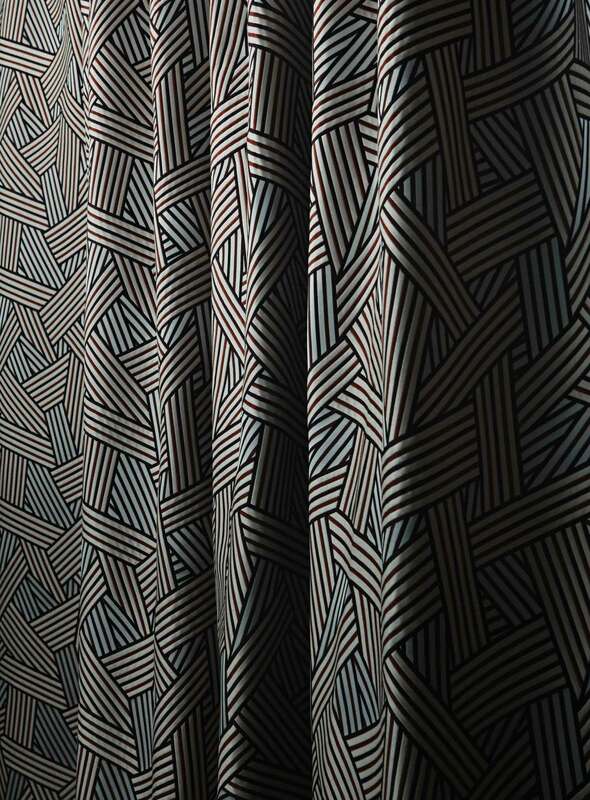 Just one of the amazing colour and pattern details provided by Dedar through their amazing curtain fabrics. 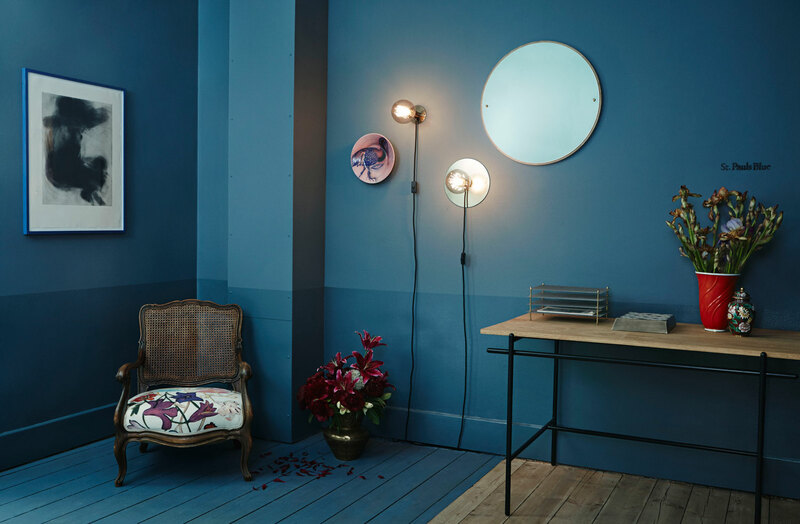 During Frama’s Salon exhibition as part of 3 Days of Design, pieces from their own collection, including CM-1 mirror, E-27 wall light and WD-1 table, sit effortlessly alongside antique vases and a re-upholstered chair, re-imagined in a Dedar fabric. Many custom metal pieces were spread throughout the exhibit, including this collaboration between Frama, Nathalie Schwer and local craftsmen Toke Lauridsen for a stunning window divider. 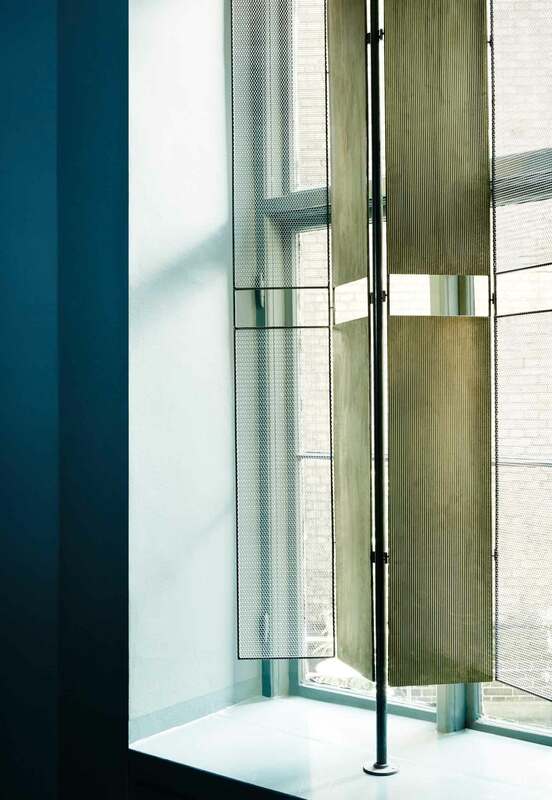 The use of contrasting transparencies with Dedar’s curtains allows natural light to enter the space, whilst retaining drama within the interior. Also featured is the Eiffel light by local lads . 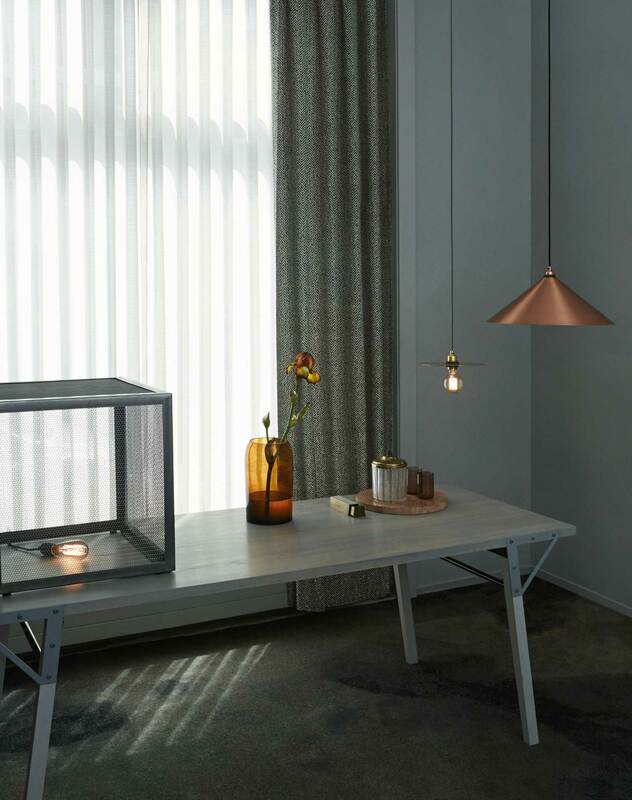 A muted finish for the T1 table is accompanied by one of Nathalie Schwer and Emil S. Jacobsen’s mesh metal structures and Frama’s in-house designed lighting fixtures. A pop of colour is added by a beautiful glass vase. One of Frama’s Cone Shades frames a side table. Their Salon exhibition is a perfect example. stood out to me through this exhibition, as it seemed more focused on selling it’s culture and brand, then selling tables and chairs. 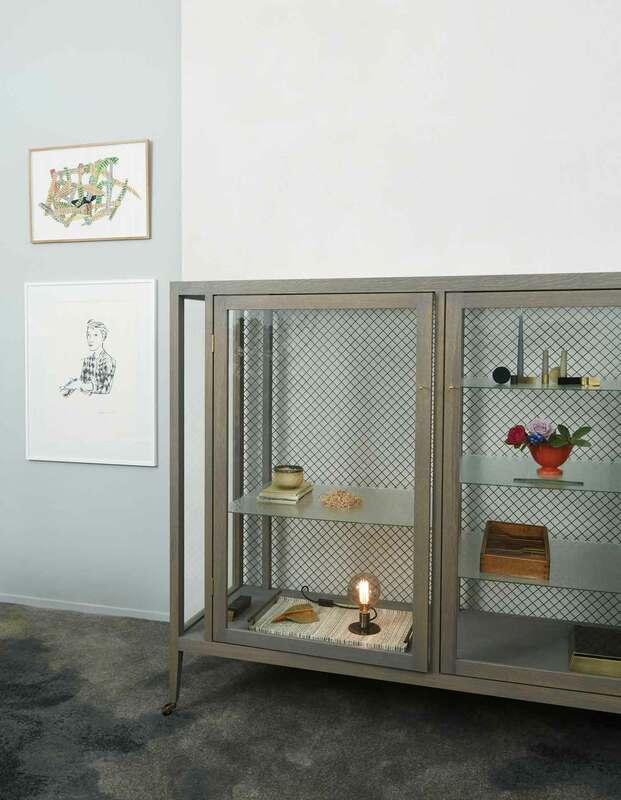 In a totally curated space, it was almost hard to tell the old from the new, Frama’s catalogue from their collaborative or even found objects. These collaborative aspects of the Salon exhibition were head to toe styled by . 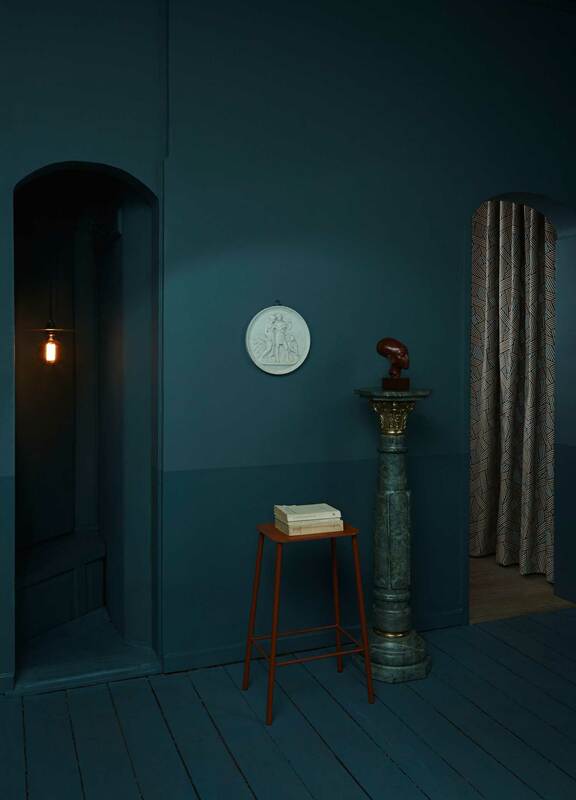 From the custom carpets, to curtains from and Frama’s own signature St. Pauls Blue paint colour for Norwegian paint supplier . Frama really take a space and make every surface part of the picture. 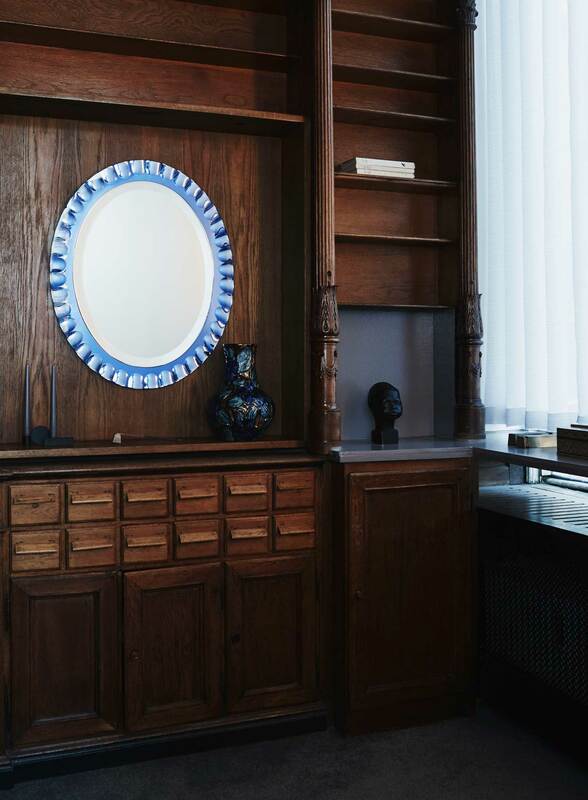 During this exhibition they also debuted the matching St. Pauls Blue timber stain with Danish company . 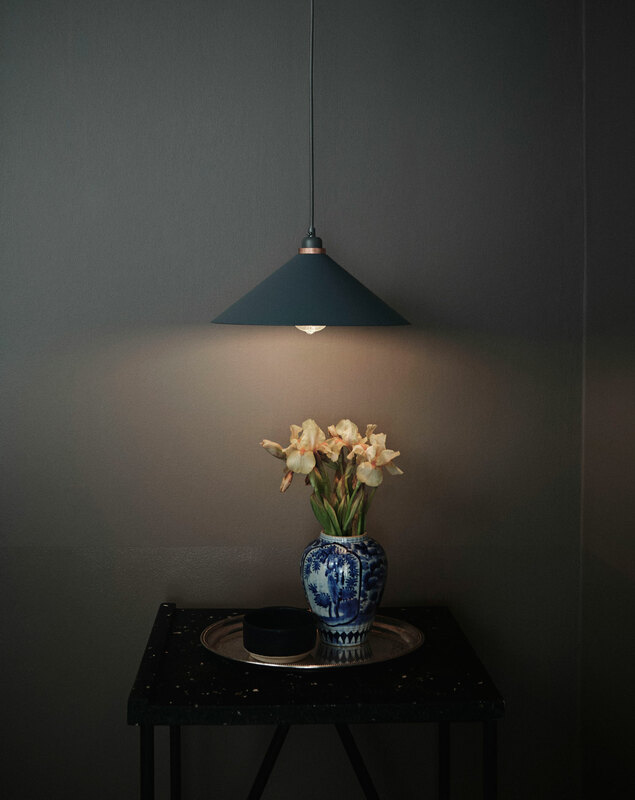 The custom St. Pauls blue was developed with Jotun specifically for Frama’s new studio and showroom in central Copenhagen. 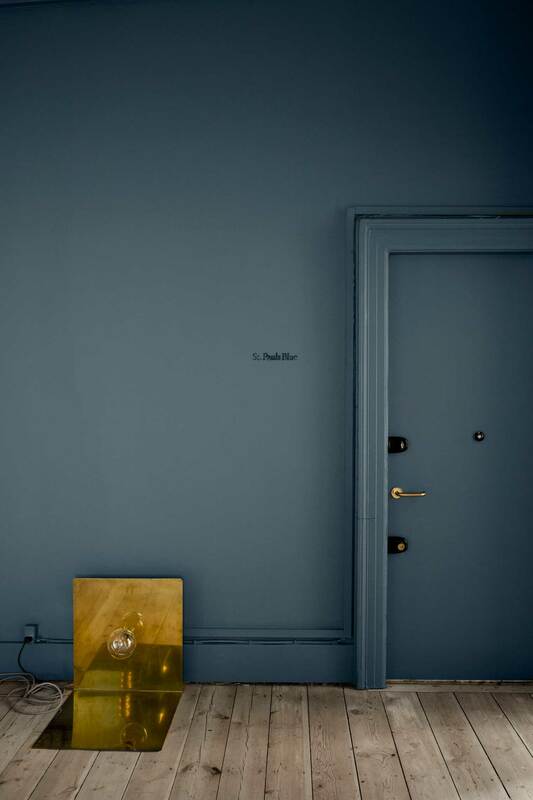 A brass 90’ Floor Light sits alongside Frama’s custom blue paint for Jotun. 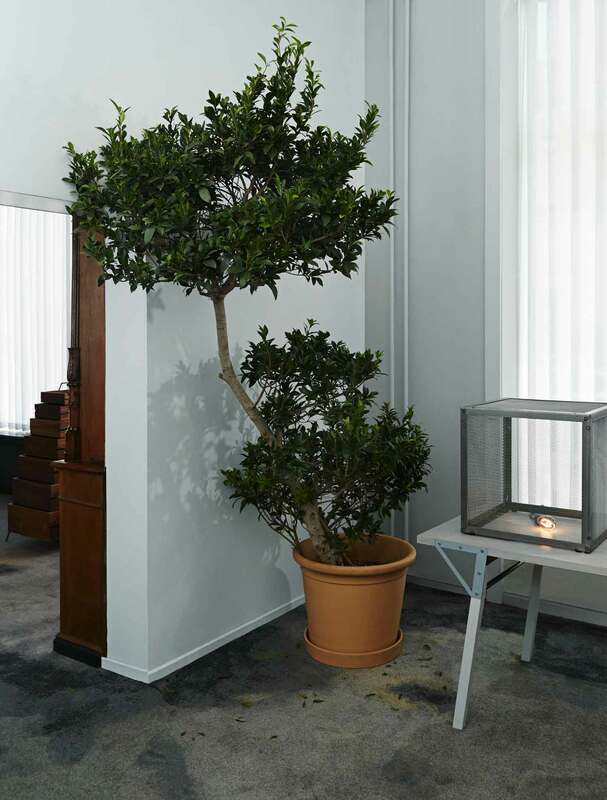 The Frama showroom is situated within the old St. Pauls Apotek on a quiet street in Copenhagen’s center. 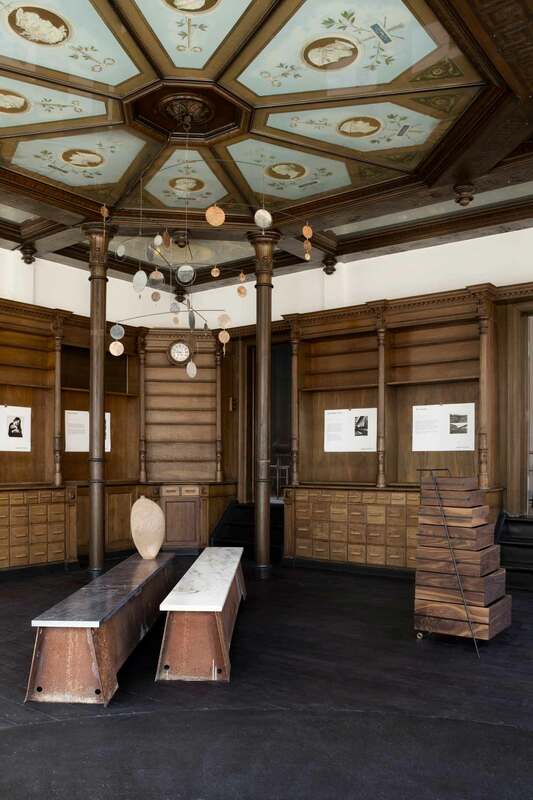 A large part of the historical interior remains, including all the beautiful timber shelving and joinery to the sides of the entrance room. 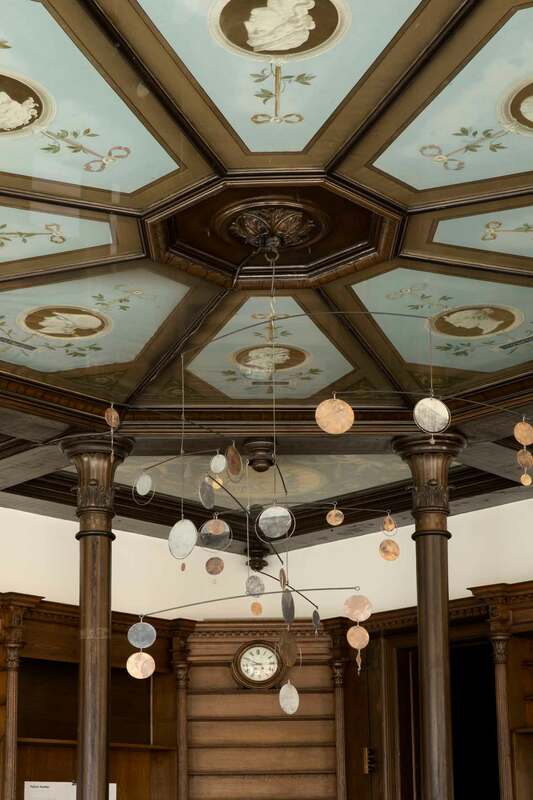 They have also kept the stunning painted glass ceiling. Seriously, how nice would going to the pharmacy have been!! I couldn’t go past a detail shot of the original draws from the old Apotek interior. They are stunning and have remained untouched by the Frama team. Looking back through Frama’s collection and various case studies only accentuates this attention to detail and total encompassing effect of their spaces. With an initial focus on their collection of retail products, Frama’s approach to design is very much centered on an honest representation of materials. This is paired with a transparency in how the production process of a product or project shape the final design. Many pieces in the Frama collection unashamedly celebrate the processes of design. The exposed screws of their F56 Trestle and CM-1 Mirror, to the raw welding and un-polished brass of the new Fundamental Candle Holders by demonstrate their approach perfectly. The home kitchen of creative director Niels Strøyer Christophersen was the perfect playground to experiment with a new kitchen concept. Don’t you love the rawness of the space? This raw character continues through the remainder of Christophersen’s kitchen. That amazing patchwork door. Blackened steel draw fronts. The single Frama E27 pendent. Love it!! 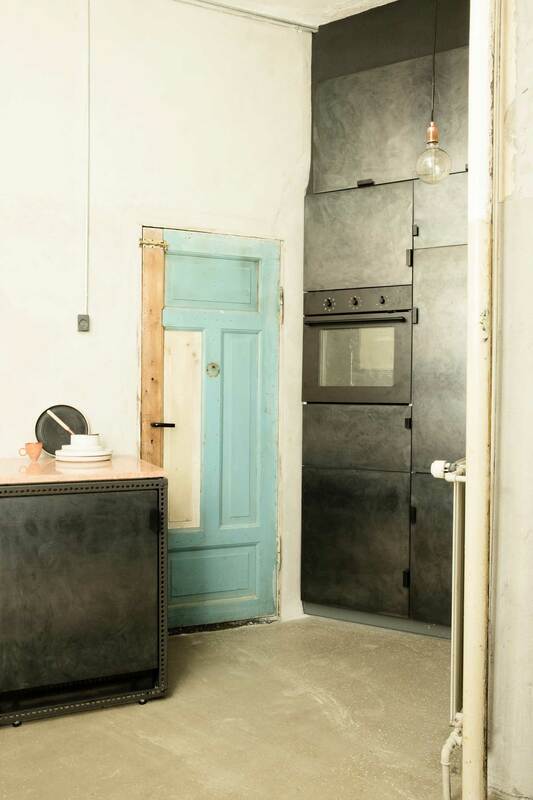 The black frame of the Frama Studio Kitchen allows it to stand out against the industrial walls and floor. A simple floating marble bench top sits aloft the rubber steel frame. 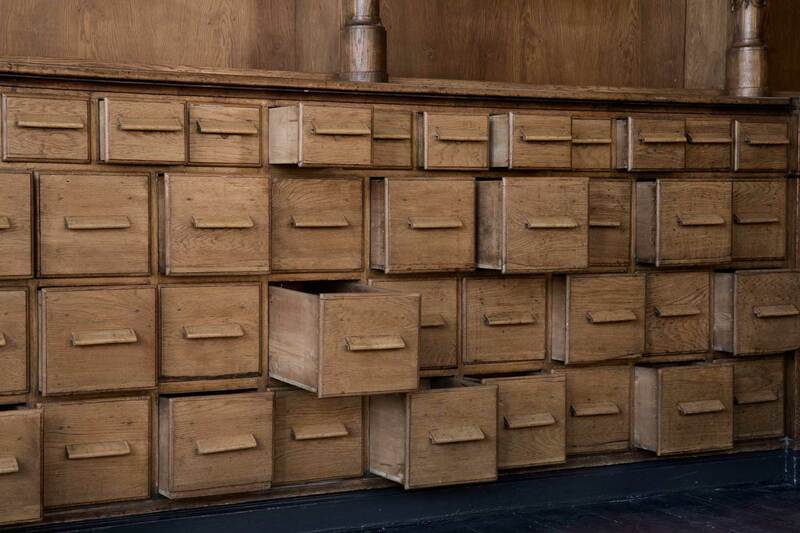 The simplicity in the Douglas draw fronts can be seen in the exposed nails. The Frama Studio Kitchen is a great example of these two worlds of product and interior fusing together. 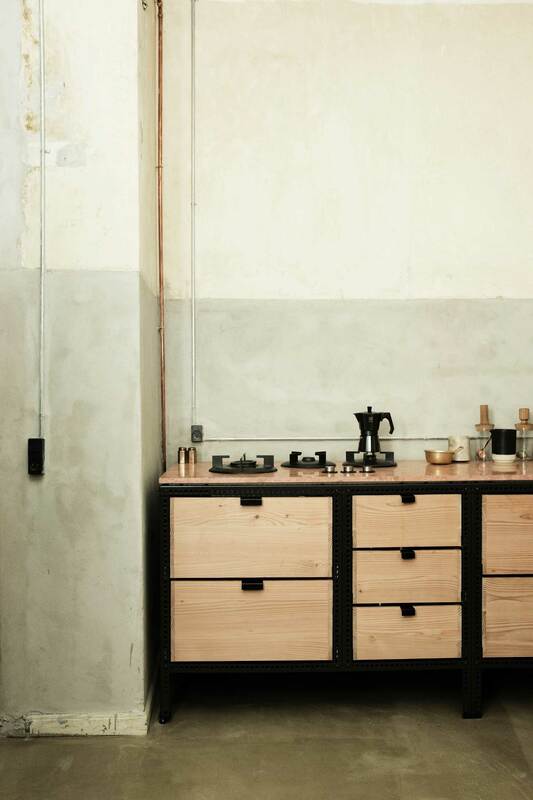 Without a requirement for fixing, the freestanding nature of the Frama Studio Kitchen aims to present it as a piece of furniture within the kitchen environment. The piece was inspired by old Italian stories, of the importance in taking your kitchen as the priority when moving house. When it looks this good who can argue with that?? 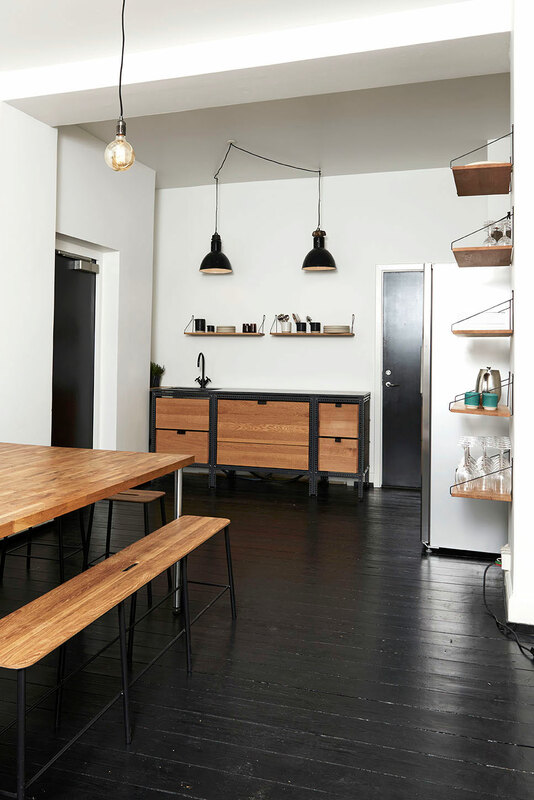 The original study of the Frama Studio Kitchen was completed in the residence of their creative director Niels Strøyer Christophersen (that takes in-house to a totally new level!!). With a hands-on approach, this first version featured a play of materials with burned nails, rubber steel, douglas fir and marble. Each piece of the kitchen is fixed with a screw or bolt, and celebrated in true Frama style. The Frama Studio Kitchen has been refined since that time and now features the use of a black powder coated anthracite metal grid frame. 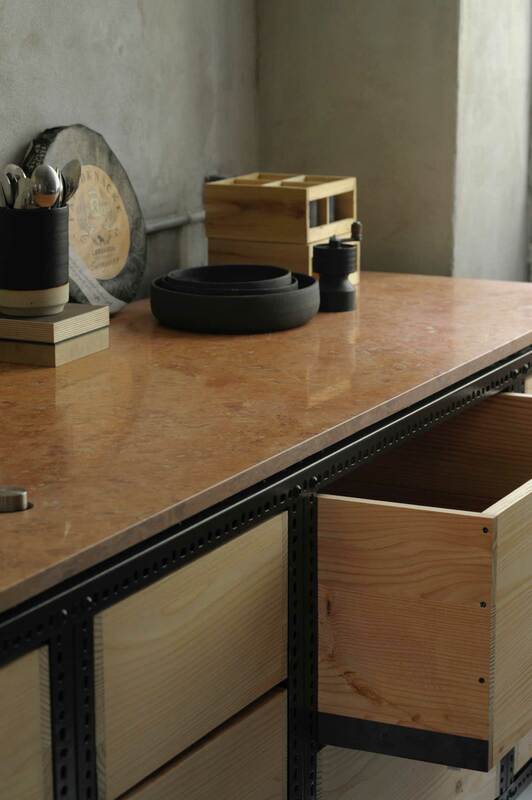 This slim industrial frame acts as a tool to highlight the beautiful choice of marble tops and oiled oak draw fronts. This current version can be seen in Frama’s newly completed interior for Copenhagen music publication . 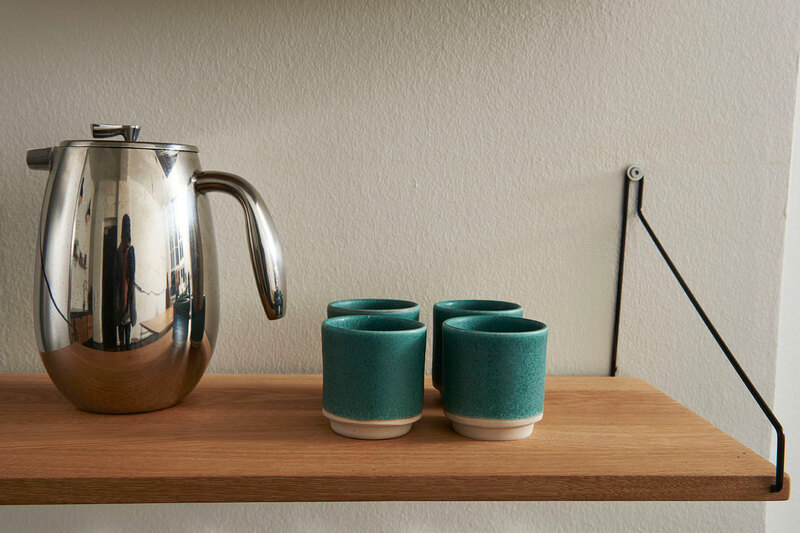 Frama’s Aj Otto stoneware cups in a brand new oxidized copper glaze, sit atop one of their shelves. The fit-out for Soundvenue’s new kitchen features an array of Frama’s collection pieces. From their Adam benches, lighting, shelves and stoneware, to their up-dated Frama Studio Kitchen with Oak draw fronts and marble table top. I love the simplicity of the kitchen unit. 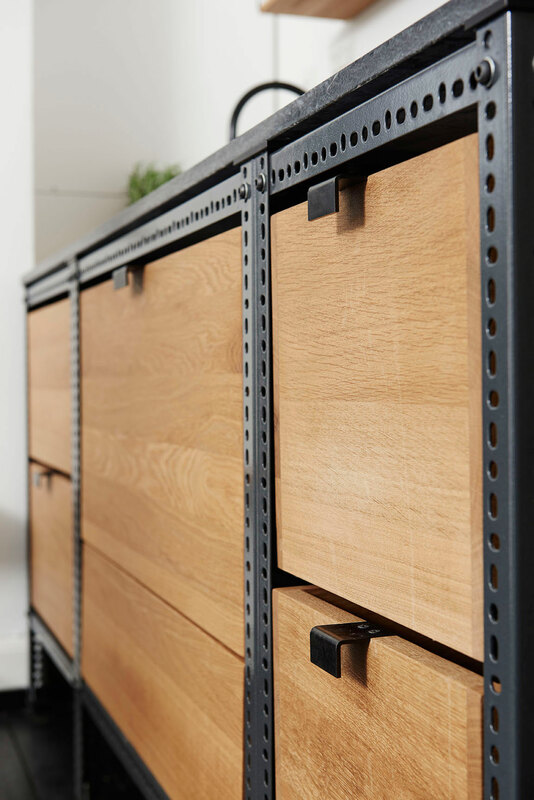 From the simple pull draw handles to the adaptable industrial steel frame. As the Frama family continues to grow, so does their outlook. An expanding but restrained range, partly designed in-house, but also through collaborations with both local and international designers is seeing them grow outside of Denmark. This increased collection does not diminish Frama’s other projects however. 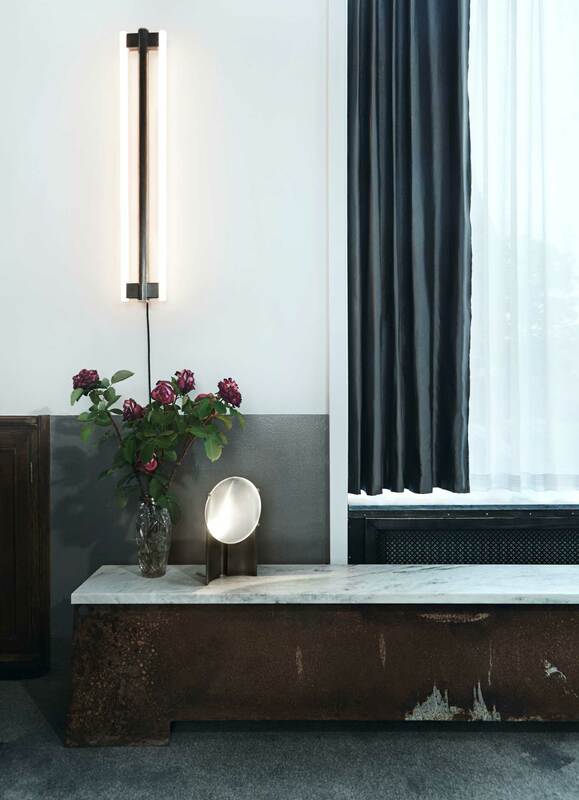 With recent completions to interiors for Soundvenue and local hotel SP34, pop-up displays in Berlin, and a continued priority on collaborations is making sure Frama is seen as more than a furniture brand. Oh, did I also mention that the Frama collection will soon be available in Australia through ? I almost forgot. Hotel SP34 // Copenhagen, Denmark. 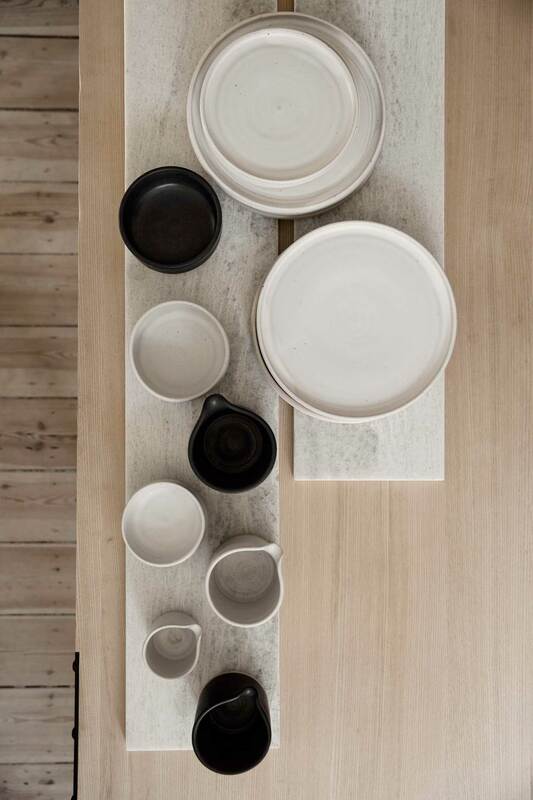 A collection of the Aj Otto Stoneware made in Denmark.